Known as the UK’s favourite bird, the robin (Erithacus rubecula) is seen all year round but is most commonly seen (and heard!) in autumn and winter. Both males and females have the recognisable red-breast and the younger birds have no red breast, and they are spotted with golden brown. Many people (myself included) think that this little garden bird is very cute- however they are a very aggressive territorial bird species, and the main reason you will hear them calling out frequently is to ensure other birds and robins know of their territory. They’re very quick to drive away intruders to ‘their’ land. They are from the family known as ‘Turdidae’, commonly known as Chats and Thrushes. 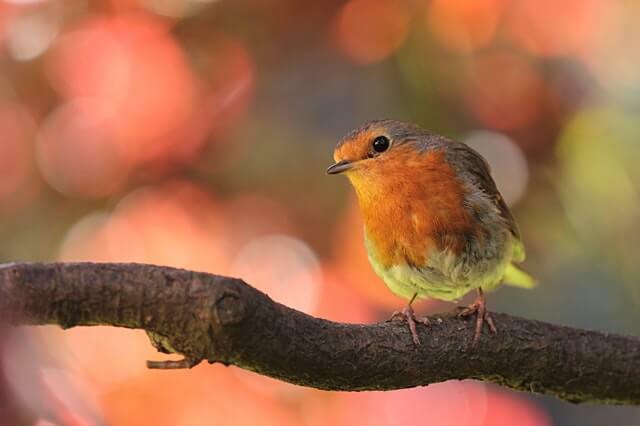 They like to eat worms, seeds, fruits and insects, and they are known as the gardener’s friend due to their appearance when the soil is being turned over- how many robins could avoid the prospect of a worm or various other insects so readily available with help from their human gardener friend? Robins from countries colder than the UK commonly migrate to the UK over the winter. These birds are often paler in colouration, and less tame- so whereas the regular robin in your garden won’t mind when you step into the garden, the migratory species will scarper within a moment of seeing you. If you look at the robin from a magical or spiritual perspective, it can signify new growth and renewal in many areas of life. It can also help to bring faith and trust into a new beginning of any kind or a new venture. If the robin is your spirit guide or totem animal, you have the ability to will new growth into your life. It can indicate that you can find contentment in all circumstances, and also to find pleasure in the simple things in life. Often you will have prophetic thought and vision and your wisdom will be highly sought after. Robin can teach you to let go of any personal drama and move forward with grace and tenacity, and also to ensure you’re exercising compassion and patience in mental, spiritual and emotional areas of your life and also in relation to other people. It may be that you don’t necessarily have the robin as your spirit animal or totem, but it may be that you get a robin visiting your garden or bird feeder regularly. Breeding: 5-6 white eggs, speckled with red, from March- July. (This information refers to the British Robin, rather than the robin from anywhere else in the world).